Concentrated flow of ionized air removes static and dust! EXAIR's Ion Air Cannon neutralizes static electricity and cleans at distances up to 15 feet (4.6m) with no moving parts. It is ideal for those hard to reach spaces or confined areas that require a concentrated flow of static eliminating ions. With an optional pressure regulator, the air volume and velocity are infinitely adjustable over a wide range, for light to heavy duty applications. The Ion Air Cannon will maximize ionized airflow while minimizing compressed air consumption. A small amount of compressed air is used to entrain a high volume flow of surrounding air. This combined stream is ionized by an emitter point (shockless) and delivered to the charged surface. 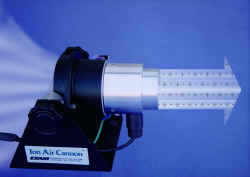 A hose or tube can be connected to the air intake of the Ion Air Cannon to draw quality air from another area. It requires only 10 PSIG (0.7 BAR) for most applications. The compact design saves bench space and allows mounting in confined areas. The sturdy stand is pre-drilled and can be wall, bench or machine mounted. It incorporates a swivel adjustment for directing the airflow. The Ion Air Cannon incorporates a Super Air Amplifier* and ionizing collar, energized by a power supply. A small amount of compressed air is injected into the barrel of the cannon (1) inducing a high volume flow of surrounding air to flow through it (2). An emitter point at the discharge end of the cannon (3) ionizes the entire airstream. The result is a high volume, conical flow of ionized air (4) capable of eliminating static and cleaning at distances up to 15 feet (4.6m). Because more than 90% of the ionized air is induced, the Ion Air Cannon produces maximum airflow at minimum air consumption. Electrical: For use with 5 kVrms, 5 milliamperes (max.) power supply, Model 7901 (115V) or 7907 (230V). Power Supplies are UL Listed, CSA Certified. Electrical Hazard: Shockless (less than 40 microamperes short circuited). Do not use near flammable materials or gases! Shims: Thicker shims can be installed easily if additional hard-hitting velocity is required.